Have you ever read a book or listened to a discussion and found your mind wandering? Has anyone ever mentioned ‘listening skills’ as a challenge for you? Have you so much going on you are not sure what to focus on first and flit to from one thing to the next? This morning I was reading an article that should have engaged me, however I found myself skipping paragraphs and my thoughts moved onto my next meeting whilst still looking blankly at the page in front of me. It got me thinking about the different elements that drive our ability or our desire to engage with the material or people in front of us. When doing my coach training we came across the concepts of ‘figure’ and ‘ground’ in Gestalt theory. The figure is what holds your attention at any one time, whilst the ground includes one or more things that are not immediately holding your attention but are in the background. In Gestalt theory our attitude plays a large part in determining what we focus on. the choice I made or did not make in taking on the activity. Some of you may be familiar with the work of Timothy Gallwey and his publications such as ‘The Inner Game of Work’, ‘The Inner Game of Golf’, etc. etc. He dedicates a chapter of his books to ‘Focus of Attention’ and considers the role of these very elements in achieving focus. Gallwey states that ‘focus feels very good, and the work that comes from a focused mind is generally good work’. 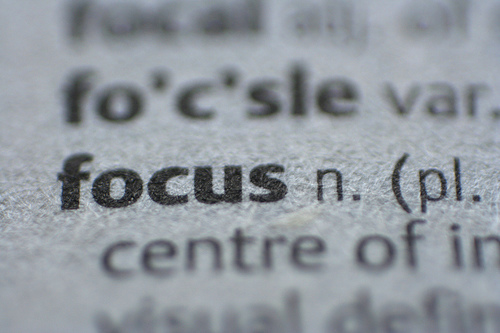 If focus leads to good work, then how do we become more focused? In an ideal world we would be doing work that interests us, that we are bought into and which we are motivated by. From a corporate perspective if this can be achieved, we will go a long way to getting the best from our people. When inevitably we lose focus from time to time, it may be worth trying to understand what is driving this. Am I simply not bought into the task? Am I dis-interested? Are my motivations for engaging in this exercise unclear or insufficient? Are there any consequences to not being focused/ delivering on this task or not engaging fully in this conversation? Once the driver is understood, we may be in a position to take ownership of the issue and address it. This might involve for example a greater understanding of the consequences of not focusing, a change in attitude or indeed a decision to consciously remove focus from the task at hand as there really is something else that is more deserving of our attention. Whether you are interested in golf, tennis, skiing, music or work Timothy Gallwey has a book on the subject and they are well worth reading.